We are hugely excited to be announcing this news !!! His Royal Highness Prince Charles has a desire to see young people engage in learning experiences that promote confidence, personal development and offer training in real life skills. Our creative partnership working with @Historic Environment Scotland, Craft Scotland and Banff Academy on “Meet Your Maker” and our further work on our “Make IN Metal” Programme with CLD North Aberdeenshire has led to this visit. We strongly advocate creativity, learning and the positivity of making. We hope to discuss our work with Young People with His Royal Highness and introduce him to the Vanilla Ink Family. To share the excitement and mark this event, we at The Smiddy are offering 15% off ALL our classes until he arrives on Monday…. On the evening of Thursday 28th March, we attended the opening of the Meet Your Maker Exhibition at Duff House in Banff. This AMAZING project was funded by Historic Environment Scotland and Craft Scotland. Three Makers were invited to work on the project: David Powell (Willow Sculptor): Naomi McIntosh (Designer and Maker) and our very own Megan Falconer. We have been working with National 5, Higher and Advanced Higher Art students from Banff Academy since October 2018 to teach them new skills and develop creative work to display at this exhibition. These AMAZING Young People did not disappoint. 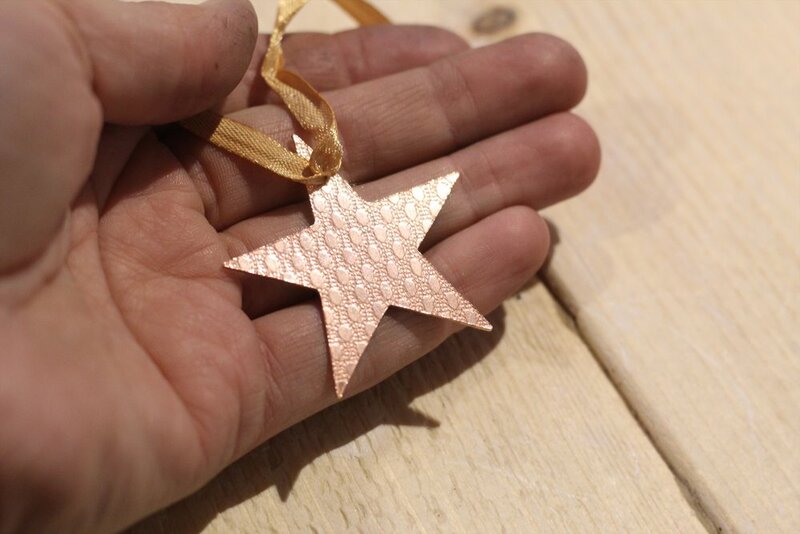 The students were lucky enough to experiment in Willow, Paper, Silver and Copper and the work was of such high quality. If you can… go and see the Exhibition at Duff House. It is open until 5th May 2019. Welcome back to The Smiddy blog, we have recently finished up on our second ‘Make in Metal’ programme. The classes are part of a funded project which allows us to offer a number of free 4 week courses for 16-25 year old’s within the Banff area. The blocks we have completed so far have included an introduction to silversmithing, where we saw the students make their own bespoke silver spoon and bowl from scratch. The second block introduced the students to jewellery making, where they learned how to make a silver ring, etch a silver pendant and learned how to set a stone into jewellery. The experience has been fantastic and it has been a pleasure to see the creativity within these young people, as well as their energy and positive attitude to learning new skills which has been so refreshing. At Vanilla Ink, we strongly believe that making has the power to give individuals a huge sense of achievement and we are so pleased to be able to offer these courses at The Smiddy to students as a place to experiment, explore and express themselves, and of course learn new skills! 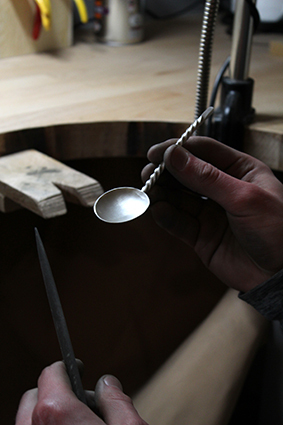 One of our students cleaning up the solder join of their handcrafted silver spoon. One silver spoon inspired by the students pet, we love how creative these young people have been during this session. Three students with their silver spoons, all inspired by different animals - a bear, a cat and a dog. Soldering on a base to their silver bowl. Hand stamped quote around the top of this students raised silver bowl. Silver ring with a cabochon stone set in the centre. Selection of pieces made by one students during their 4 week jewellery making block. Silver ring, etched pendants and a stone set pendant. Hello everyone and welcome back to our blog, where we will be telling you all about what has been going on at the Smiddy in February. This month has been particularly exciting for our team as we have started our first ever ‘Make in Metal’ programme for young people (aged 16-25). The first class we are running covers an introduction to traditional silversmithing which will see a group of 6 students create a silver spoon and a silver bowl over four sessions. The participants have now completed their first two weeks - creating a silver spoon using sheet and wire components and soldering them together and will spend the next two weeks learning the technique of raising in order to form a small silver vessel. Last weekend we also hosted our very first ‘Make a Wedding Ring’ workshop at The Smiddy, where we had a lovely couple make each others wedding ring for the big day. One chose a plain traditional style band, while the other chose a contemporary twist style ring. This class is a bespoke workshop which is completely tailored to the couples preferences in regards to design, metal choice, finish etc, which is why we invite couple to have a consultation before the workshop in order to design and plan their ring. We are now taking bookings for wedding ring workshops throughout 2019, so make sure to get in touch if you are interested. In other exciting news, we are so happy to have hosted our very first CARVE workshop at The Smiddy last weekend. Here at The Smiddy in Banff, along with the Glasgow Vanilla Ink site, will be the two new locations to have CARVE workshops, and we have plenty more dates throughout the year so don’t panic if you missed this one! CARVE is a fun, creative and relaxed class where you carve a piece of jewellers wax using a number of tools (files, carving tools, scalpels etc) to remove wax in order to create a design of your choice. Your carved wax is then cast in silver and you get to wear your very own creation whenever you want! We have some good news to share with you in our blog this week, not only are we progressing with our collaboration with Craft Scotland and Historic Environment Scotland with the ‘Meet Your Maker’ program, but have also secured funding to launch 4 x 4 week jewellery/silversmithing courses for 16-25 year old’s in Banff - and for free! The students taking part in the Meet Your Maker project are coming to the end of their time with silversmith Megan, and will now spend the next two months with Naomi McIntosh and David Powell to learn further creative skills. We are so impressed by the work that the students have been working on (age range 14-17) at The Smiddy. Saw piercing sterling silver vessel by Banff Academy student. Our ‘Make in Metal’ courses for young people in the Banff area will launch next week starting with introduction to silversmithing where the students will learn to create both a silver spoon and a small silver bowl under the instruction of our silver. These courses aim to work with young people who want to gain a new skill and some experience working in a silversmithing workshop in a friendly and welcoming environment. More information on each class can be found online. We have also introduced a new jewellery taster session for 2019 - make a silver spinner ring. We hosted our first class a couple of weeks ago and it was a fantastic success. Have a look at these beautiful rings that were made at The Smiddy in 4 hours! Next class is Saturday March 9th! Welcome back all and I hope you are having a lovely weekend! Last Sunday we missed our weekly blog due to our silversmith Megan exhibiting at Elements - a festival of jewellery, silver and gold in Edinburgh, but we are back this week to share what we have been up to at The Smiddy. This week we welcomed our first groups of particiants in our 8 week programmes at The Smiddy, including introduction to silversmithing, introduction to jewellery making and intermediate jewellery making. In our introduction to silversmithing class, we started off by teaching our students the traditional technique of raising. Starting off with a copper sheet, we spent our first three hour class making great progress on a small copper vessel. We also started our first intermediate level course to those who have previous experience in jewellery making and we started off by getting use out of our lovely new rolling mill, by learning how to recycle our scrap silver and inlaying other metals into the new silver sheet. Finally for the week, on Friday evening we taught a lovely group how to make a silver ring and make silver granulation in our first beginner class for the term. This week we will be introducing some of the Banff Academy art & design pupils to The Smiddy in our first session for the Meet Your Maker programme. We can’t wait to share how it goes in next weeks blog. Welcome back everyone! This week, we spent a little bit of time away from The Smiddy, from attending a meeting discussing our involvement in the Meet Your Maker programme, to visiting a silversmiths workshop in the Borders to gain some valuable insight into a workshop set up. On Thursday our silversmith Megan met with the Historic Environment Scotland team, who, along with Craft Scotland, selected us for their new project which will see young people from Banff Academy learn new skills. As part of the project, the students will make work inspired by Duff House and the current ‘Scotland’s Early Silver’ exhibition, using The Smiddy as a space to develop and create their designs. This project is a collaboration which will allow Art & Design students to learn a variety of new skills and be imersed in new processes by three professional makers - Megan Falconer, Naomi McIntosh and David Powell. As part of this project, our silversmith Megan has also been commissioned to create her own piece of work inspired by Duff House and the silver exhibition. We can’t wait to welcome the students to The Smiddy and share how they get on learning a range of traditional and contemporary jewellery and silversmtihing skills. Alison and myself also had the opportunity to attend then opening evening of ‘Scotland’s Early Silver’ exhibtion at Duff House which was the final destination for this show, and what a stunning display of silver it was. On Friday this week, Megan and the Founding Director of Vanilla Ink Studios - Kate Pickering, visited Adrian Hope, a silversmith based in the Scottish Borders. Thanks to Adrian’s knowledge about the industry and profession, he very generously shared with us some great helpful information and tips to set up our workshop, tool making and much more. We spent most of the time in awe of his range of silversmithing tools and talent for making beutiful pieces of silverware. A quiet week on the classes front, as we prepared our course schedule up until Christmas, which are all now available to book in the classes section of our website. We are also almost fully booked in both of our jewellery 8 week blocks with only one spot left in each, so if you have are interested in learning a range of new skills for a 3 hour session every week for eight weeks then don’t forget to book now to avoid dissapointment.